This entry was posted on June 15, 2016 by Texas Safety Supply. Being an Industrial person, you must be aware of the common cut hazards ( that can cause injury . Any industry thrives on the skill of the industrial workers and their safety carries the utmost importance. Next time, you struggle with these industrial hazards without using essential gears like Cut Resistant Gloves, please rethink. Naturally, hands are the first among our body organs that defend against these hazards and you should prioritize the safety of hands. You industrial work may differ from another’s and thus, Cut resistance levels rating should be strictly taken care of while opting the best Cut Resistant Gloves for your industrial purpose. Cut resistance rating ensures that you are getting an adequate level of protection for your specified industrial job. Understanding the difference between ANSI and EN 388 is very important. These are the two rating systems used to describe the cut resistance level. If we talk about the terminology used, ANSI is the american based standards while EN 388 is the european. The test protocols differ from one another but are found be slightly similar in rating the resistance levels. Both defines the cut resistance from level 0 to level 5. The ANSI use a razor sharp flat metal blade to tear through the cut resistant material and EN 388 uses a round metallic blade to pierce through the material. Both tests are equally valid on the ground of testing, however the ANSI is found to be the preferred choice among the industrial workers. The worker’s compliance and adherence holds a lot of value in PPE usage. It has been found by OSHA that maximum injuries take place when the workers are not wearing gloves. The most common reason is non compliance or ignorance. Also, many workers cannot afford the higher rating gloves for financial reasons. If industries take up the responsibility to assign these gloves to the workers on their own cost, the workers will tend to adhere more to the safety precautions. Spreading awareness and educating the workers through the regular safety seminars can add a lot to the safety aspect of an industry. ANSELL HYFLEX 11-501 is one of the popular cut resistant gloves that are used in the industries. Another is SHOWA BEST KV350 cut resistant gloves that are known to provide tough resistance in the industrial conditions. 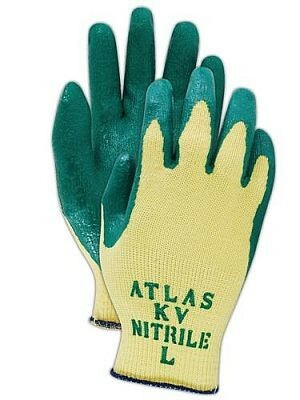 Investing in right kind of gloves whether it is done by the worker or the industry is necessary. Using an inappropriate glove is equal to compromising the safety. Cut resistant gloves with level 5 rating is not required when your job demands level 3 cut resistance. The fit, size and dexterity are equally important to consider while purchasing the one. Texas Safety Supply deals in providing the best safety equipments and gears for your industrial purposes. You may call us 214-764-3527 for more information.